I hope you enjoy this look back at some of the best of All Things G&D from 2012! January kicked off with Kate’s 2nd birthday…and a birthday means a birthday PARTY! I went all out for Kate’s Elmo & Sesame Street themed birthday party, and we had an incredible time! 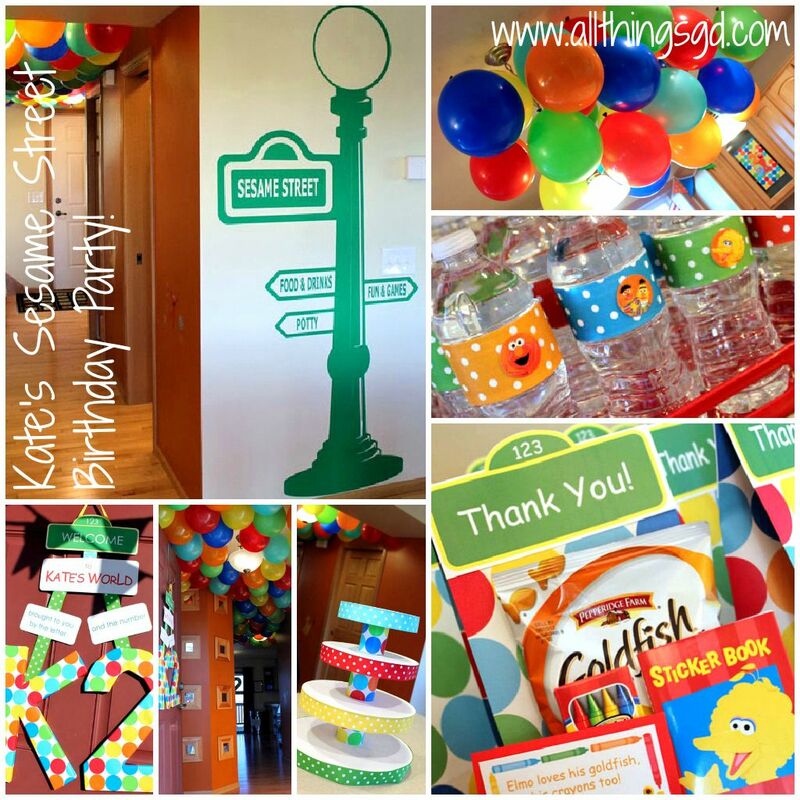 Kate’s Sesame Street Themed 2nd Birthday Party! Once I finished up Kate’s party planning, I finally got around to compiling a one-stop shop for all of my pregnancy-related posts including links to my weekly pregnancy updates, maternity fashion, labor and delivery stories, that damn 4th trimester, and my pregnancy rules to live by. Last, but certainly not least, ridiculous amounts of fun was had when some of my girlfriends and I flew to New Orleans to surprise our pregnant friend Natalie with a visit! We helped her with her baby’s nursery and got our asses kicked on Bourbon Street. That’s living life at both ends of the spectrum, my friends! February was a grueling month in that it kicked off my 2nd annual Whole Living Challenge to eat clean and try new (healthy) foods and recipes – a challenge that many of my readers joined me in! In between all of that, I also tried my hand at Marshmallow Pops for Kate’s daycare Valentine’s Day treat, reflected back on my 2011 Resolutions, rocked some hot pink tights, and highlighted my favorite baby products from birth to 3 months. In March I blogged about my ATG&D Facebook page hitting 1,000 likes (woot! 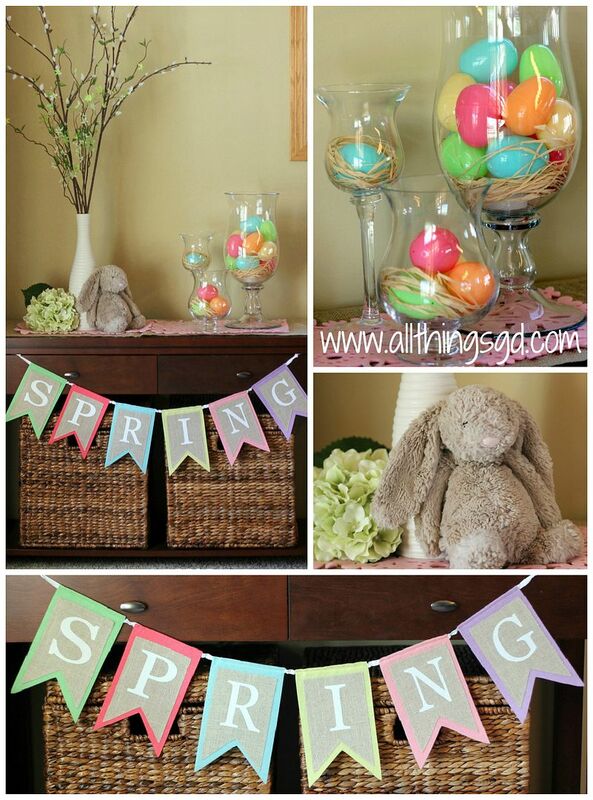 ), shared my ideas for 20 candy-free Easter egg fillers for toddlers, and decorated our house for spring for the first time. 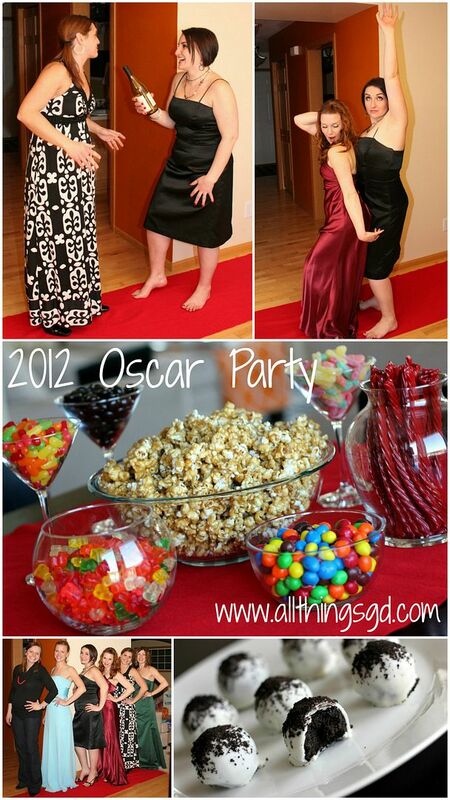 Also in March, I tried out a tutorial on how to get waves without using heat so I could have SJP-like hair for my annual Oscar party – a night filled with fabulous friends, old bridesmaid dresses, a candy buffet and, of course, a red carpet walk-off! In May I blogged about our Seattle trip, tried out red skinny jeans, shared even more of Kate’s favorite lunches, showed off a “thank you” care package using a scarf in lieu of tissue paper, and celebrated my fabulous new blog design, created by my friend Allison at The Adventures of VAMH! In June I was thrilled to show off our new granite kitchen countertops, and equally exciting (if not more so) was attending the Haven Conference! I could have never predicted how much fun I would have, how many wonderful people I would meet, and how much I would learn when I signed on to attend this blogger’s conference primary geared toward DIY/home decor bloggers. From being sandwiched by Sherry from Young House Love and Katie from Bower Power, to booty shaking it for Karianne from Thistlewood Farm, to getting nearly zero hours of sleep after staying up all night gabbing with my dear friend and hotel-mate Beth from Unskinny Boppy – the experience was so rich and full that it was easily one of my highlights of the year! 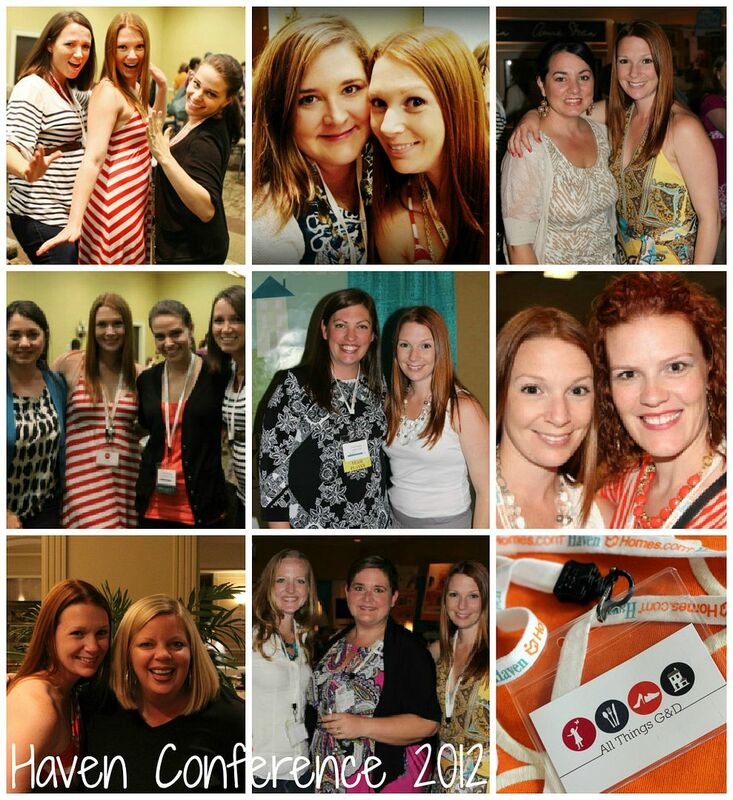 The Haven Conference 2012: Making friends with some of the most gorgeous and talented women in blogging! 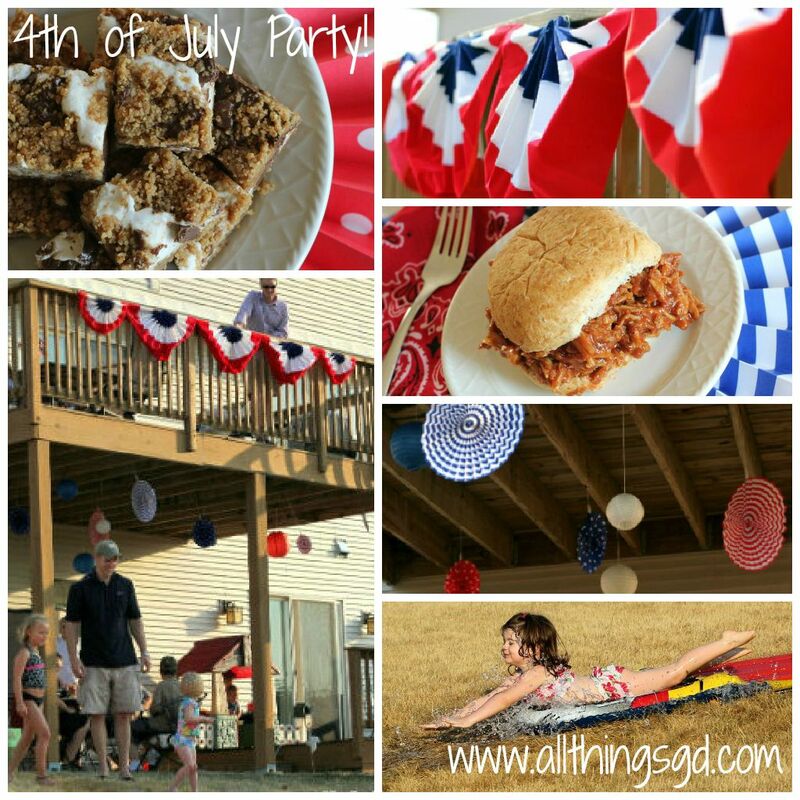 July 2012 saw the long-awaited reinstatement of my summer staycation, and our 7th annual Fourth of July party! Complete with homemade BBQ sandwiches, homemade marshmallows, a s’mores tower and s’mores bars, a slip & slide for the kids, a fantastic fireworks display, and all of our favorite people – this year’s party was our biggest and best one yet! August was a slow blogging month for me, but the bests of the month were finishing my second half marathon, and blogging about my mad negotiating skills which led to the awesome deal I landed on my new car! I’ll always remember that salesman with fond memories and a smile. I like to think he does the same. In September I shared my solution for keeping Kate’s painting, sticker, and coloring projects under control with our organized art display, recapped the cra-mazing (last year’s Whorecation (published while on this year’s), got started on Kate’s new “big girl room” and had a photoshoot with the phenomenal Melissa Oholendt for headshots for my blog! Any chick who can make me look good after a 5 hours drive (<-she’s worth it) is definitely cra-mazing. Oh yeah – I blogged about the camera crew that came to our house to shoot footage for a national Oreck television commercial! It was crazy. And amazing. That was my September blogging – a month so unreal I had to make up my own word for it. In October I blogged about the coffee lover’s gift idea I created for my friend Katie, shared an idea for festive fall snack mix, ran my first Color Run, showcased my 2012 A Week in My Life series, my new inifinity scarf, our non-scary Halloween decorations, the premiere of Oreck’s VersaVac commercial featuring an appearance by me and G, my tricky Halloween outfit, and the incredibly creative and thoughtful Happy Anniversary pumpkin bouquet that G surprised me with on our 9 year wedding anniversary! 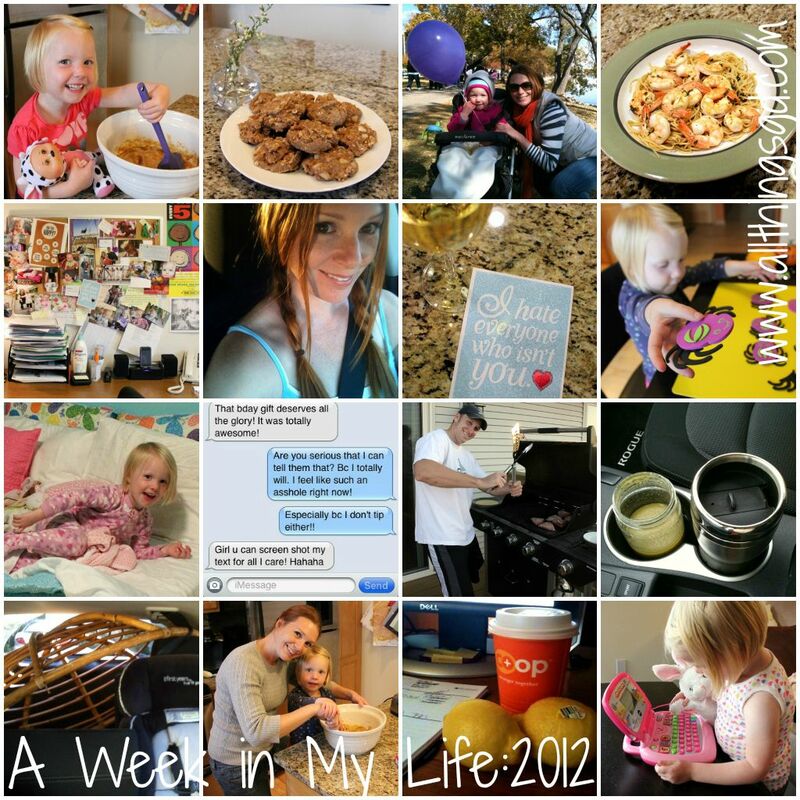 A snapshot of my Week in My Life series from 2012. I took care of some unfinished business in November by completing the Tyranena Half Marathon – a race that had been haunting me for five years! I also shared my idea for mailing a hug care package to loved ones, showed off my love of mixing stripes and colors, and our colorful Christmas tree. 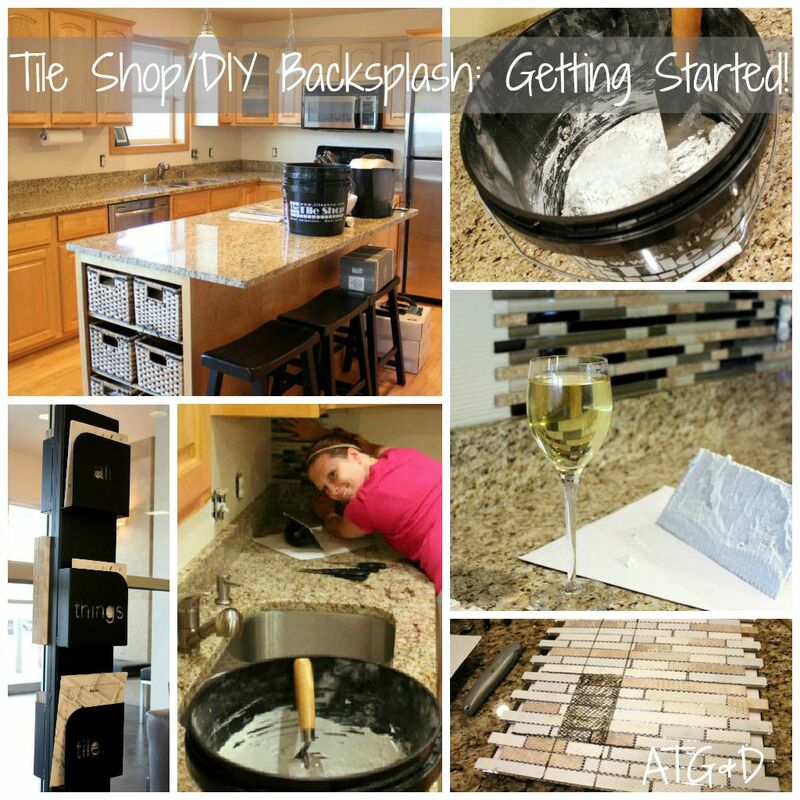 November also kicked off my first Month in Review photo recap, and my super exciting partnership with The Tile Shop for our DIY kitchen backsplash project! After a tour of The Tile Shop and attending one of their free DIY tile classes, I was ready to get started on my new kitchen backsplash! 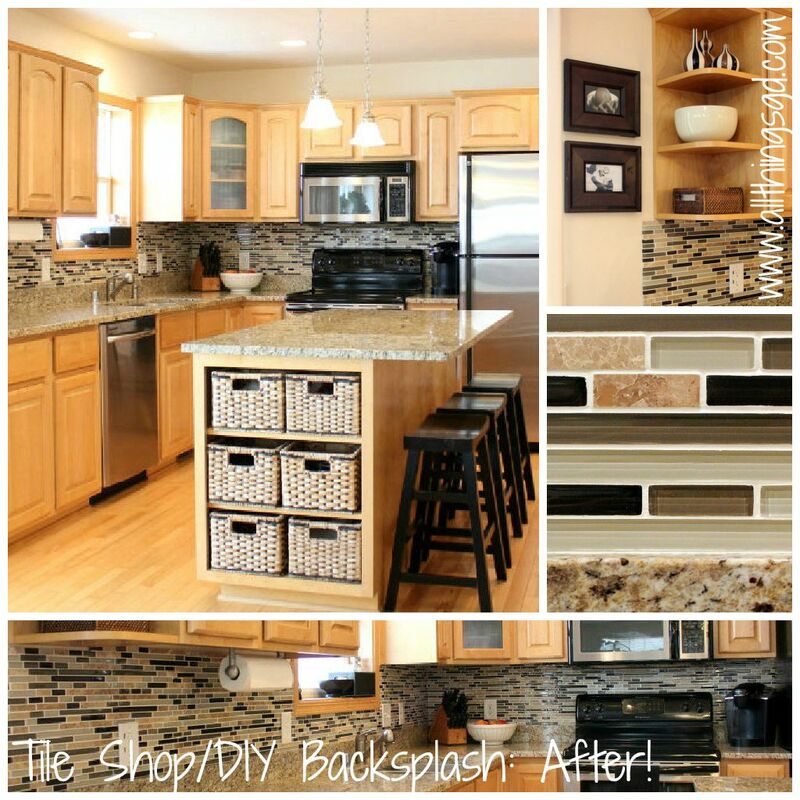 I finished up my DIY tile kitchen backsplash in December and was thrilled with the results! My new DIY tile kitchen backsplash! 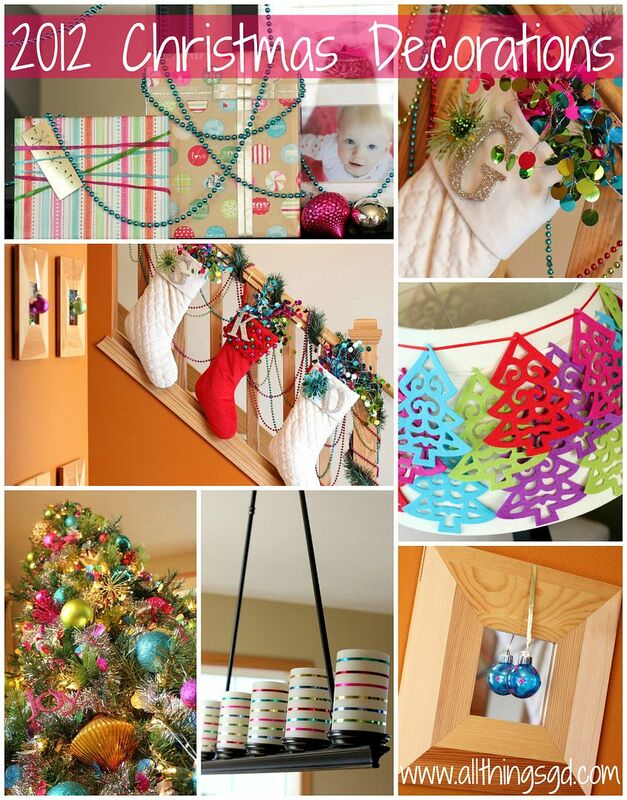 My attention then turned to decorating the house for Christmas – something I look forward to every year! I blogged about our sparkly holiday entryway trimmed with ornaments over mirrors and stockings bursting with color, our gift-wrapped photo gallery wall, playful metallic ribbon-wrapped holiday letters, Kate’s crazy and creative Christmas tree, and everything in between! I wrapped up the month of December with a tutorial for sparkly holiday nails, perfect for ringing in the new year! Of course, throughout all of 2012 I also continued capturing Kate’s interests and developments as she grows (found in Kate’s Monthly Posts), and my list of “Things Loved” – a collection of my favorite products, entertainment, etc. each month. That’s my All Things G&D “yearbook” for 2012! All-in-all it was a full, fun, and surprising year. Thank you so much to those of you who shared in it with me! I would love to know if your planning on doing the Whole Living Challenge again this year?? I didnt think I was ready to do it in 2012 but I think I could really stick to it this year! @Maggie: I am! Sadly, Whole Living is going under, but they’ve promised they’ll still put out their January/February issue which includes their 2013 Whole Living Challenge. They should be releasing it this week or next, and I think I’ll start it on Monday, January 21st. I’ll post more info on my Facebook page once I know more, so be sure to like ATG&D on Facebook if you haven’t already. I’m exited you’ll be joining me!! Awww great recap! I am SO happy to have been included in three months of your 2012, even if you only blogged about 2 of em. Did nobody blog about our Watercolor GTG this year? I can’t remember! Love you, chick! See you in August!! What a year! I hope 2013 is just as awesome! Love you! @Beth: Seeing you is always a highlight of my year! I’m not sure that anyone did blog about our Watercolor GTG. I listed it in my All Things Loved in September post, but that’s as far as I got. What a trip! @Allison: The same to you, my dear and wonderful friend! WOW. What a crazy busy year! 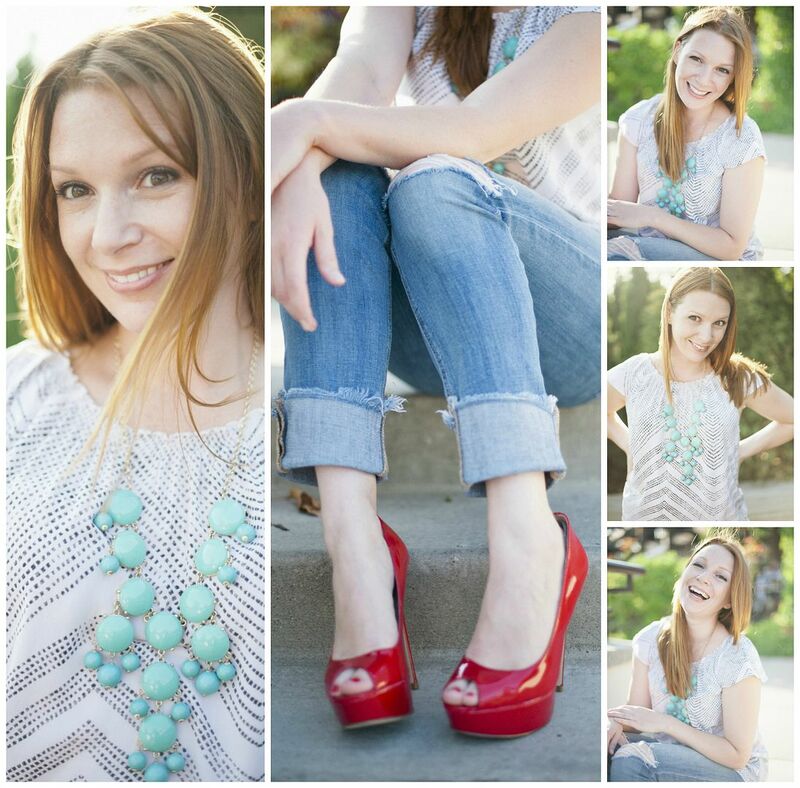 I’m new to your blog, so what a fun way to get caught up.